Bathrooms are turning into the new refuge, and some busy professionals feel it's one of their only chances to get some alone time during the day. Built-in TV's and radios, saunas, coffee makers and Jacuzzis are all being incorporated into bathrooms. 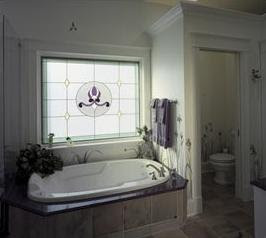 Your bathroom window treatments should complement the look of your bathroom decor while also meeting the unique conditions that need to be addressed in a private space. Consider the environment; bathrooms are humid. Even if you want a bathroom window treatment fit for a queen and your heart is set on drapes or roman shades, explore synthetic options that won't mildew. Ditto for hardwoods that can warp—go faux wood, composites or vinyl and save a few dollars while you're at it (i.e. faux wood blinds, faux wood shutters). 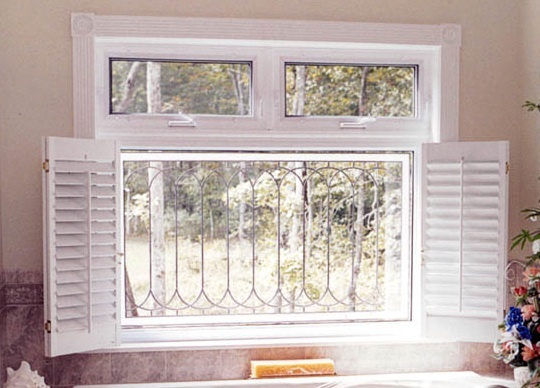 Ventilation is important in a bathroom, so make sure your window treatment doesn't interfere with the operation of the window. Privacy, privacy, privacy. If your bathroom windows face the street or a nearby neighbor, consider light controlling blinds or shades (cloth, aluminum, vinyl, and natural wovens), operative shutters or lined panels. 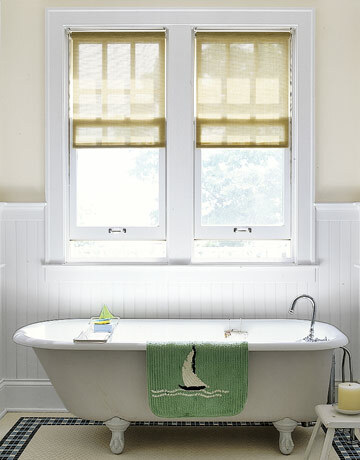 For windows on second or third floors, consider top down/bottom up upgrades that offer both natural light and privacy.